From Rock, to Lucky Penny and back again - a colour story. February 05, 2014 in "colourway", "etsy update", "smokestack socks"
Psst :: I reference the Etsy Update a lot in this post! If you don't know what I'm talking about, check out Tuesday's post here. Some colourways just happen. Once in a blue moon I know exactly what I want, I make a plan, dye some yarn and everything comes out exactly as intended. More often, however, colourways are a tad more mysterious to me and kind of take on a life of their own. They start with an idea and end up wherever they are supposed to. Developing Club colourways can be difficult because I'm usually aiming for something very specific. Working on Etsy update colourways is a completely different ball game. There is so much freedom, nothing is planned, we just experiment as much as we want to and are always surprised and *usually* are thrilled with the results. Every colourway has a story. I thought it would be fun to start sharing some with you here. 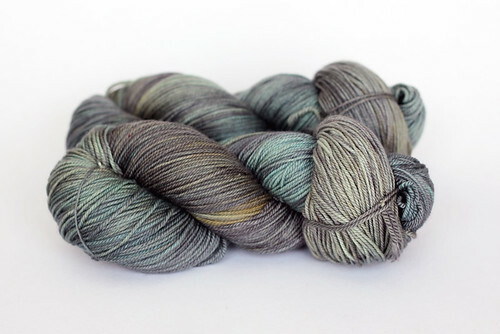 Back in November 2012 we came up with a lovely, soft colourway that I called Rock. It had a little bit of grey, some beige, soft turquoise that in some places overlapped with a light mustardy yellow colourway making green spots too. I loved it. The batch we dyed had one flawed skein, which I was happy about because it meant that I could keep it! Just a bit more saturated = LUCKY PENNY! I loved the colourway so much that the next time we were playing around for an Etsy update I tried to recreate it. I was a little more heavy handed this time and the results were not what I was expecting. More saturated, more turquoise... more fabulous! 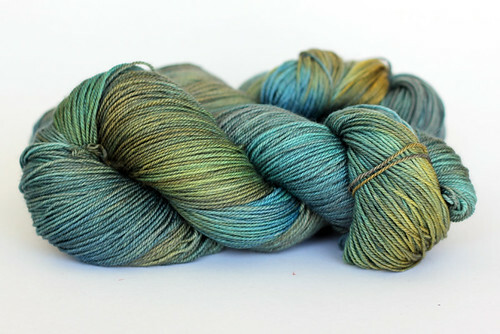 That's how a not-quite-right Rock became one of my favourite colourways ever: Lucky Penny. Fast forward over a year later and I still had that skein of flawed Rock sitting in my stash. I still loved the soft colour and decided to use it to cast on for a new sock design that had been brewing. After having spent a bit of time with it, I was re-committed to giving it another shot in the studio. Knowing that we went too saturated the first time we tried to recreate it, we used our Lucky penny recipe as a starting point, then paired it down, made a few changes and came up with a brand new version of my lovely Rock. Looking at these photos it looks like Rock has come a long way from it's original lighter-Lucky Penny self, but in person the two versions were actually very close, our new Rock is just a bit more grey, which I love - I've never met a nuanced grey that I didn't like! Smokestack Socks - pattern coming soon! So there you have it! Rock inspired Lucky Penny and then Lucky Penny was the key to cracking the code to a softer, subtler Rock. It's a very complex colourway, difficult to photograph (aren't they all!) It's sometimes grey, sometimes beige, sometimes green, but always lovely. I've finished up the socks I was knitting with my skein. 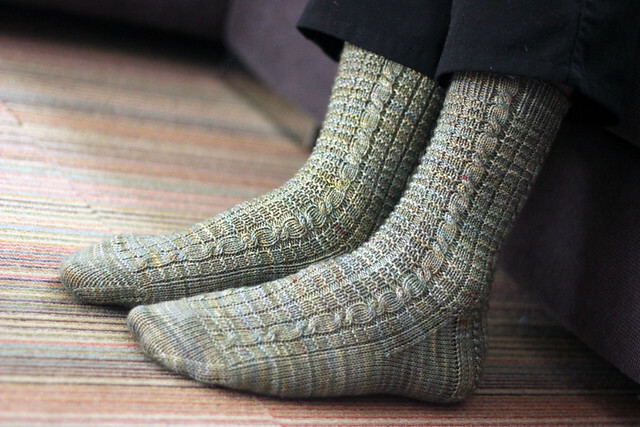 The Smokestack Sock pattern will be available within the next week or two. 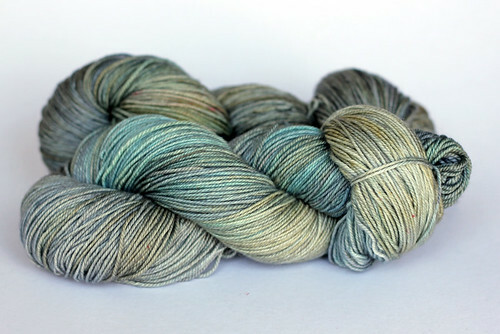 If you'd like to knit yourself a pair in Rock just like the sample, Friday is your chance to nab a skein!